Paul’s real name was ‘Saul’. He had been an active and vicious opponent of the early Christian faith. In Acts he is recorded as approving the killing of St Stephen, the first Christian martyr, who was stoned to death. On one of his missions to persecute the Christians, Saul was travelling by road to the city of Damascus. He was blinded by a brilliant blaze of light and God spoke to him, saying ‘Saul, Saul, why do you persecute me?’. Saul’s companions took him to Damascus, where his blindness was cured and he was converted to Christianity. He took the name ‘Paul’ at this point. This event is seen in the background of the panel, and Paul gestures towards it. The style of the painting suggests that it was done by a Netherlandish artist. However, many artists from the Netherlands were working in England in the 17th century and their work influenced that of English glass painters. Formerly at Donnington Grove, near Newbury, Berkshire. Paul's real name was 'Saul'. He was an active and vicious opponent of the early Christian faith. In Acts he is recorded as being amongst the crowd that condemned St. Stephen, the first Christian martyr, who was then stoned to death. On one of his missions to persecute the Christians, Saul was travelling by road to the city of Damascus. He was blinded by a brilliant blaze of light and God spoke to him saying; 'Saul, Saul, why do you persecute me?'. Saul's aids took him on to Damascus where his blindness was cured and he was converted to Christianity. He took the name 'Paul' at this point. This event is seen in the background of the panel and Paul gestures towards it. The style of the painting would suggest that it was painted by a Netherlandish artist. However, many artists from the Netherlands were working in England in the 17th century and their work influenced that of English glass-painters. 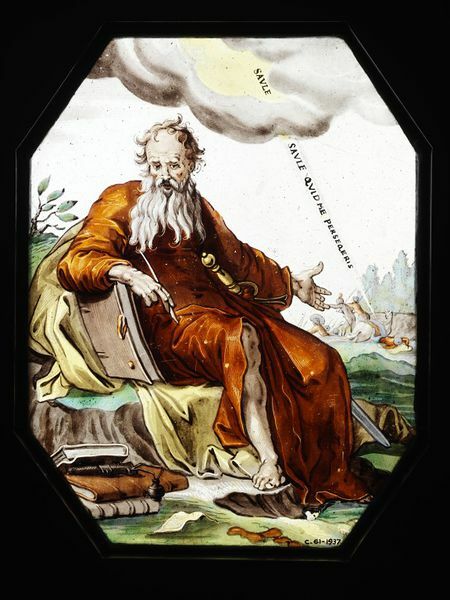 Panel of clear glass painted with enamels and yellow (silver) stain. 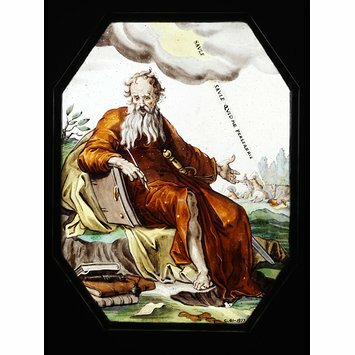 Depicting a figure of St. Paul. Netherlands or English, ca.1680. In the background is shown the Conversion of Saul on his way to Damascus, with the words of God: SAVLE SAVLE QVID ME PERSEQERIS ('Saul, Saul, why do you persecute me? ').